I was standing on the north side of Bremner Ave, halfway between York St and Simcoe St surveying the future site of the Southcore Financial Centre & Delta Hotel Toronto towers, on a hot Weds Aug 9th 2011 afternoon, just after 5pm. It was quitting time, and I was there at the gate, waiting for these guys to knock off for the day. 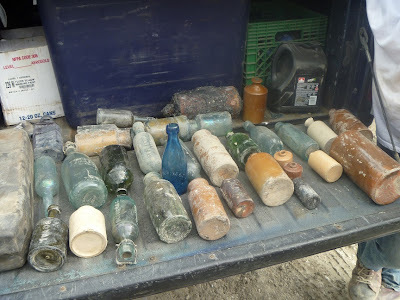 Once again my contacts had put me onto another downtown Toronto excavation site run by people who will let me shoot their bottles and tell their stories, alongside the history of the property. But on that day the massive hydraulic backhoes were still down there jack hammering the shale fifty feet below the sidewalks at a quarter after five. They hadn't quit yet. There was no sign of my merchant historian friend either, but I could see the excavation workers were also expecting him. They were milling about two pick-up trucks about hundred meters away, inside the fence. To my delight I could see one fellow setting up some antique glass bottles in the tailgate exhibition. I waved at the crew and rather trepidatiously walked into the yard, expecting someone to evict me. I held up my camera and announced that I was party to this show and sale – I was a friend of so and so, and so was expected? Harry, the youngest member of the excavation crew, had just taken off his green fluorescent reflective vest, and was kicking the sand out of his work boots as I approached. 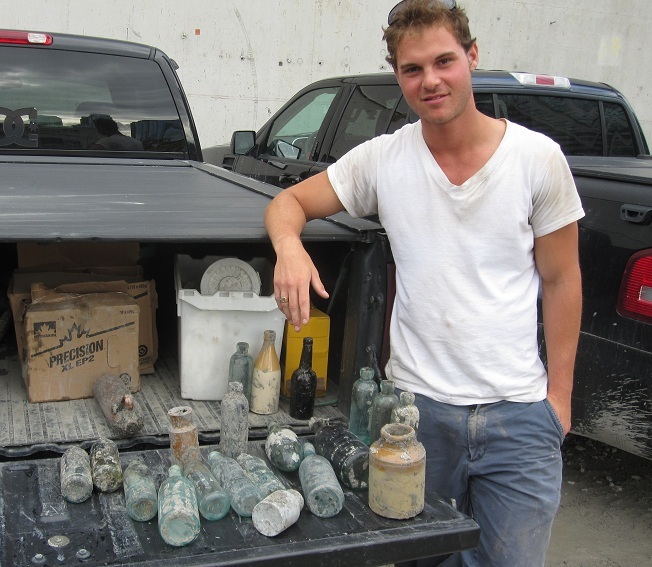 He smiled and shook my hand and then gestured to the array of ready glass that was waiting to be perused and photographed – his display would be documented on Dumpdiggers for the rest of time. I told him who I was and he said 'yeah, I like your site'. So I knew he knew what he was getting into by standing in front of my lens beside historic Canadian glass. The bottles actually belonged to the backhoe operator, but most had been retrieved by Harry, this young lad who manages the gate; his job is to document each and every truck that comes through the gate. He's the camp secretary. When the excavator shakes his bucket a certain way, it’s a signal to Harry to come over and pick up the bottle that’s visible underneath the behemoth’s jaws. There is minimal disruption to the work, according to Harry who was rather proud of the assembled artifacts. This patch of land on modern day Bremner Ave wasn't a big city dump, like other sites nearby, but rather it was another stretch of the Toronto lake shore that was filled in with debris, and anything handy in the 1870s and 1880s as the railroad grew and people wanted a better port facility at the bottom of the city. 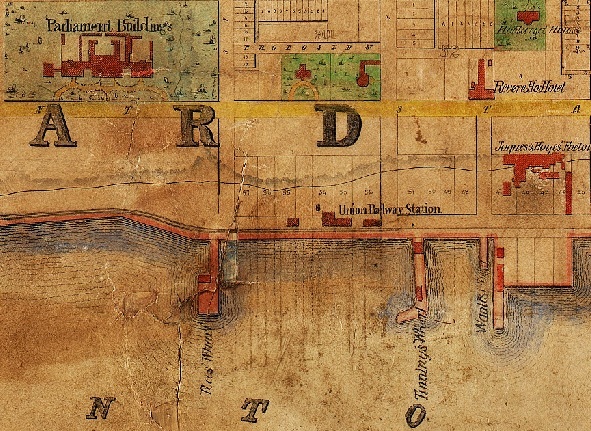 In the 1840's, before the railroad came to Toronto, this was Rees' Pier. So if we were to go back in time right on this spot we'd all be underwater or standing on the water opposite Rees Pier or what became known as the Rees' Wharf. This location is very historic. It was on these wooden docks and facilities through which the mass exodus of Irish immigrants entered the 1840's era New World of opportunities. 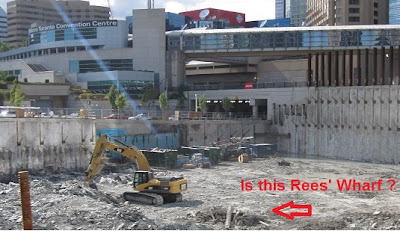 Rees' wharf was an important conduit in the city, and life in Canada. 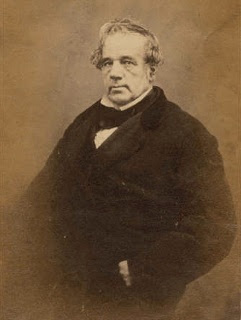 REES, WILLIAM, physician and surgeon; b. c.1800, son of Evans Rees of Bristol, Eng. ; d. unmarried 4 Feb. 1874 in Toronto, Ont. 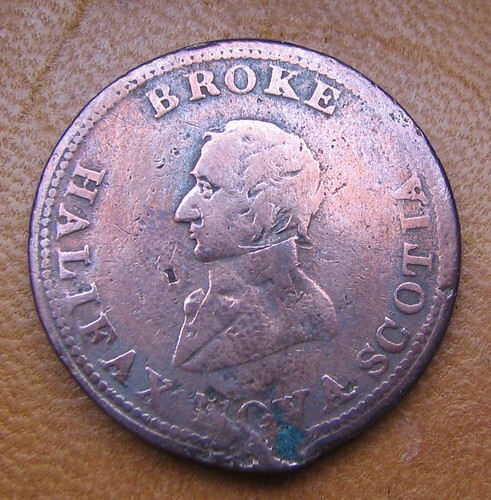 William Rees studied medicine in England under Sir Astley Cooper and came to Canada in 1819. He was an assistant health officer at the port of Quebec in 1822. In 1829 he moved to York (Toronto) and, after examination by the Medical Board of Upper Canada in January 1830, he purchased the practice of John Porter Daly. 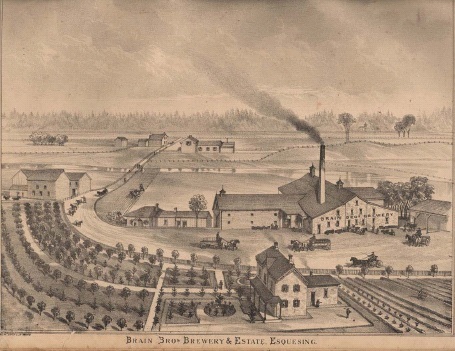 With the exception of a brief sojourn in Cobourg in 1832 Rees lived the rest of his life in Toronto. He ran unsuccessfully in the first riding of York for election to the Legislative Assembly in 1834, but distinguished himself during the Upper Canada Rebellion when he was appointed surgeon to the guard-ship at Toronto, and assistant surgeon to the regiment of Queen’s Rangers. From what this author can determine, Dr William Rees had the long wooden dock and support buildings erected in 1837 as a disembarkation point for emigrants to Toronto. Rees advocated throughout his career numerous measures for social reform and the development of public service. When he began his practice in the city he advertised that he would vaccinate the poor people and give them medical advice free of charge. In 1837 he constructed a wharf which had no formal name, but became known as Rees' Wharf and he is also said to have built public baths on the waterfront at Toronto for the use of immigrants in the same year. He lived there, or nearby in a cottage beside a small hill for many years. This square patch of the Toronto harbour became very important in the 1840s when Irish potato crops had caught a blight that caused widespread crop failure that resulted in the 'Irish Potato Famine' and one of the largest European mass emigrations in modern history. Those who pressed on to Toronto were required to disembark at Rees' Wharf, where they were processed at a make shift shed by Edward McElderry, the local Emigration Agent and representative of the Government of the Province of Canada (the union of what is now Quebec and Ontario) and Constable John B Townsend, who was the Clerk of the Toronto Board of Health. In 1847, over 100,000 Irish immigrants migrated to Canada. Nearly 40,000 of these people passed through Toronto, which at the time had a population of just under 20,000. Most had come through Grosse Ile, which was a special station set up to aid the refugees of the worst famine in the history of the British Isles. In the summer of that year, 863 Irish people died in the fever sheds that were erected at King Street West and John Street. In total 1,100 people lost their lives during this tragic time. 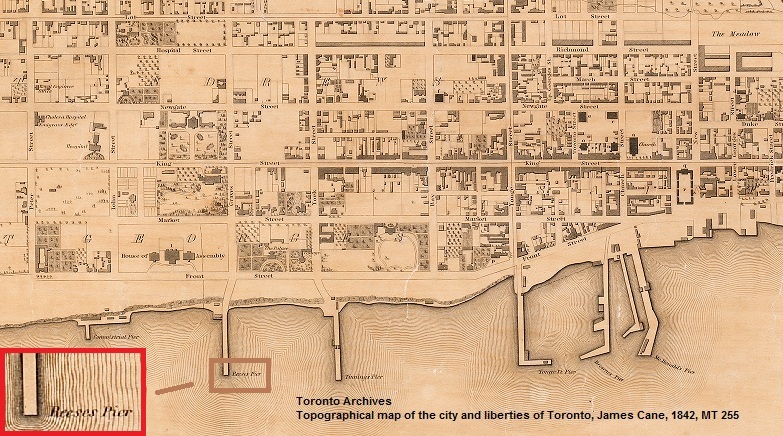 Look at this 1862 Map of Toronto. Rees' Wharf is situated just south of the Provincial Parliament Buildings. East of this map insert, there are some unfamiliar street names, like Graves St for example (became Pearl St) and Market Street. Dr Rees was already a very well respected physician in this 'garrison town' turn provincial capital. He helped found the Provincial Insane Asylum. At the height of his accomplishments he was struck by a mental patient in the asylum and it was a blow from which he never quite recovered. This incident marks the beginning of a slow decline of his professional career and social prospects. When he died in 1874 he was a poor man. The shoreline is open and lush and green as was the fashion in the 1800s. Civilized men would take the air at night and ambulate about the grounds - this was a place of recreation near the Ontario General Assembly buildings. Whenever I look at the early pictures of Toronto I’m struck by the gardens and open landscape of the lake shore. Look at this vision of the 1840 Toronto with a horse track and 'gardens' for the civilized people of Upper Canada's largest settlement. The place grew in prominence because it was a Garrison Town and home to Fort York and the seat of a shared government with Montreal - Upper and Lower Canada. 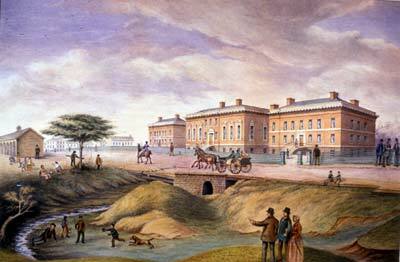 The Upper Canadian parliament buildings, designed by Thomas Rogers and constructed between 1829 and 1832, stood at Front and Simcoe streets. The surrounding area was largely a mixed institutional and affluent suburban district that had emerged after the War of 1812. However, less prestigious structures, such as immigrant sheds and taverns, stood nearby, as sharp neighbourhood distinctions did not exist in Georgian Toronto. 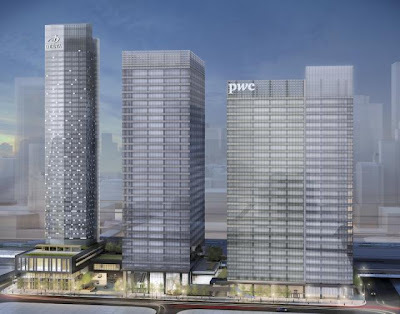 Southcore Financial Centre is a major mixed-use office tower development built in Toronto's downtown core. 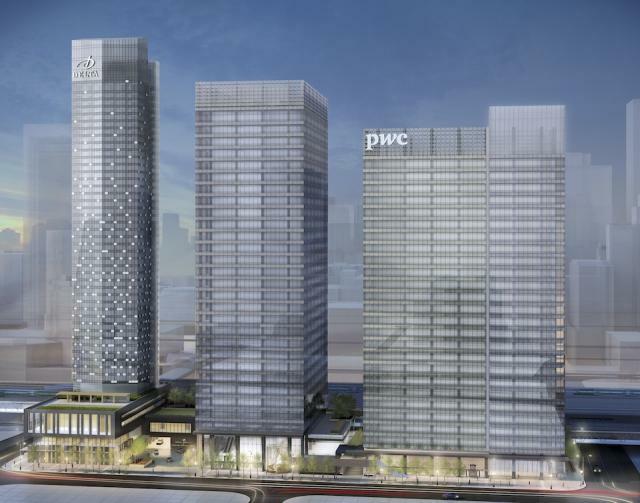 Designed to exceed the expectations of today's globally connected tenants and urban travelers, this three-phase project will include two office towers totaling 1.4 million sq.ft. and the Delta Toronto – a next generation, premium 4-star hotel. Connected to the urban forest, this fully integrated complex will provide an enclosed pedestrian access to Union Station, the Metro Toronto Convention Centre and the PATH network. Located on 3.25 acres at the centre of Toronto's expanding financial core and entertainment district, SFC occupies a full block from York to Lower Simcoe Streets along Bremner Ave. The fully integrated complex will be connected to Union Station and all of downtown Toronto via the already extensive PATH network. 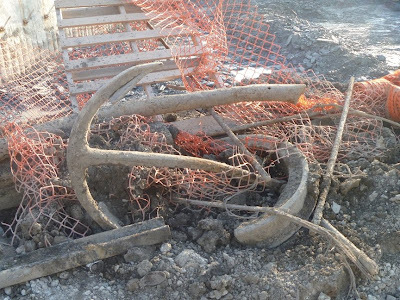 While digging the foundation for this megalith, the backhoe operators encountered pockets of dump, either material that was household trash dumped there in the 1870s to fill in the lake or the natural bottles and pottery pieces that are thrown into the lake off the pier and came to rest in the mud of the lake bed for 150 years. Not much of what happened next can I relate in any detail but suffice to say that there was a mercantile exchange and some people had to visit nearby ATM machines and get more cash. Here is a photo montage, starting with the players involved in negotiating a fair price for these historic artifacts. The buyer and the seller and the banter was as colourful as the old bottles. Here are some of the best bottles in their hands. This is a Brain Bros Lager Beer bottle from Hornby Ontario that's quite rare. This bottle traveled some distance to end up in the Toronto lake shore. This 9th Line business was established in 1845. The beer became famous and the business expanded to employ ten men and 40 horses! Only the main house remains, although it has been extensively renovated. This sketch (below) is from the 1877 Halton Atlas"
Here's a Robertson tan ginger beer bottle that another operator proffered for sale but closer inspection revealed it has a crack and that makes it about worthless according to the visiting expert. That verdict was immediately rejected by the seller who announced that it would find a ready buyer in a flea market near his house. I reflected on that - it would indeed, as this is exactly the type of bottle you would think was incredibly rare and valuable and worth buying in any condition at any price. 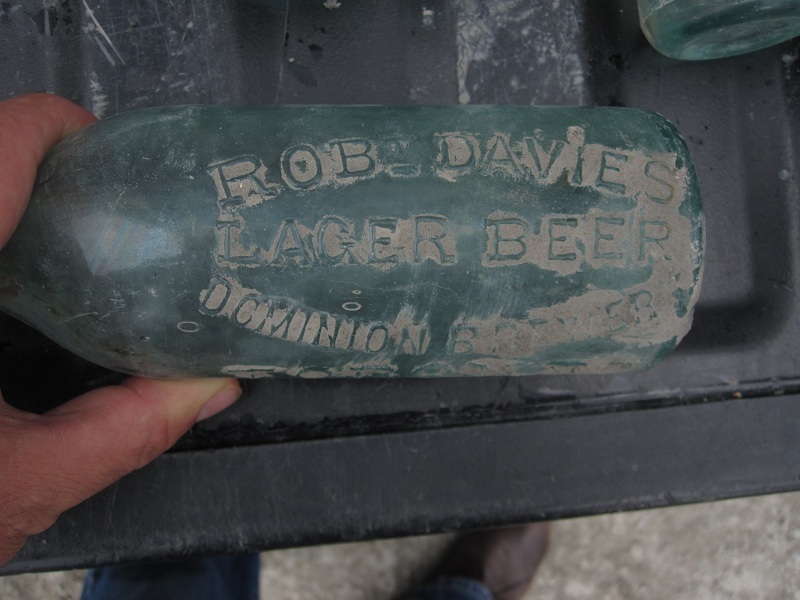 But it isn't - this is a common Toronto late 1800's ginger beer bottle, and not worth that much, especially when cracked. The Merchant Historian who is my contact to this world had visited this site one or two days earlier, and he'd made deals with another one of the machine operators. 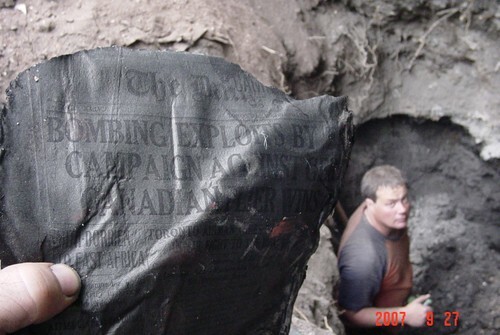 He sent me these pictures so I can show them here, and thereby offer a more complete assessment of the artifacts found on site. Here are the highlights. 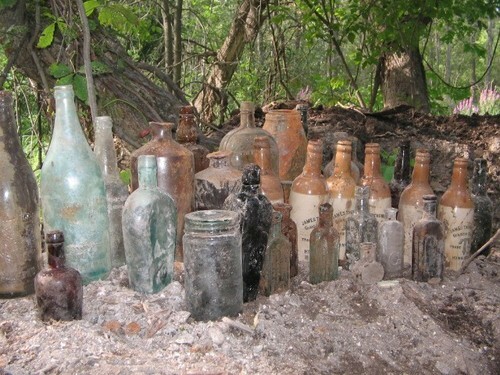 These two bottle are both rare and beautiful and date from mid to late 1800s. They were found intact with only slight damage not visible in this picture. 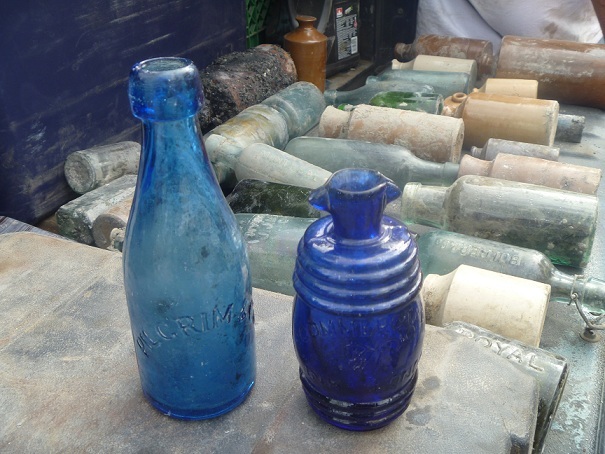 On the left is a light cobalt blue Pilgrim Soda bottle and beside it is a lovely ribbed ink bottle with spout top. This ink is embossed Commercial Ink Co London, and my merchant historian friend swears this is a product of London Ontario (which would make it worth than if was simply another lovely UK ink). The Pilgrim is worth about ?? (it has some damage) and the ink could be obtained for ? ? somebody email me, or leave in the comments more accurate price data. I will follow up if and when this piece goes to auction. In the main ditch immediately inside the gate there's a pile of wood debris and metal pipes etc that was recovered by the excavators, and separated out of the loads being shipped north as 'clean fill' to some other part of Ontario that needs building up. The metal pipes and castings are very interesting and no doubt all have stories, but the ship's anchor is the centerpiece. 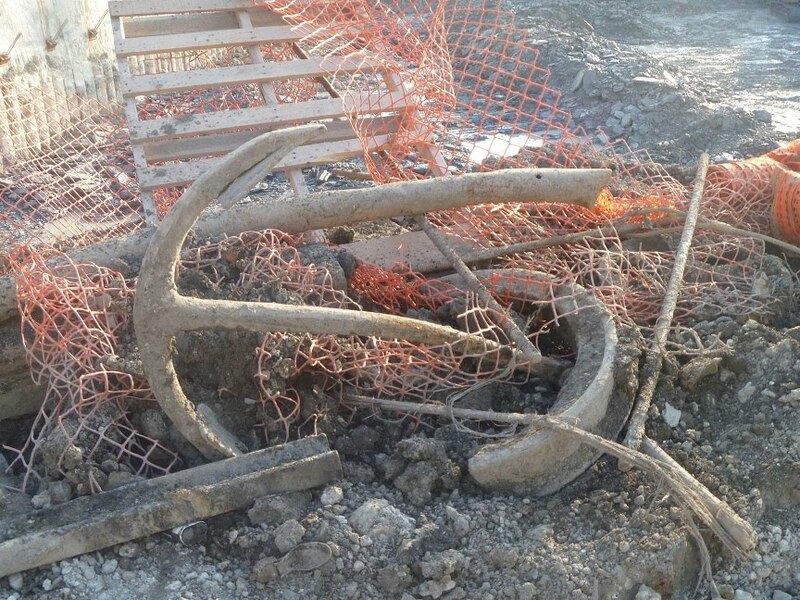 Here was an iron anchor that was lost back in the 1800s, perhaps by a sailboat, or a steamer that was docked at Rees' Wharf. I agree there must be a photo of Rees somewhere but I have not seen one and it may be 'unidentified man'. BTW: The City are laying a sewer on Lower Jarvis and I saw several bottles being dug up there on Friday - who knew they might be so valuable! Robert: I checked with the archivist at CAMH and there is a photo of Rees in Newsletter below. A few years ago I thought of writing a short piece on Rees but there really appears to be very little not already said by Canniff and in DCB. Thank you for the link and the picture of Dr William Rees. I have added it. Thanks again. Thanks for telling the story behind Rees' Wharf. I had no idea it was named after a physician. I am building up an annotated transcription of the 1861 census of Toronto (http://toronto1861.blogspot.com) and this will be a useful addition to the data. I always credit sources, btw. Something else I have thought about when reading descriptions of 1860s Toronto is how the promenades that used to take place in front of the disused Parliaments Buildings moved west to the Sunnyside area. Just found your site. This reminds of my mother in law who walks to an old dump amost every single day. It hasn't been a dump in like 50 years, but she has a crazy colletion of marbles, bottle, old spark plugs etc. Great site. 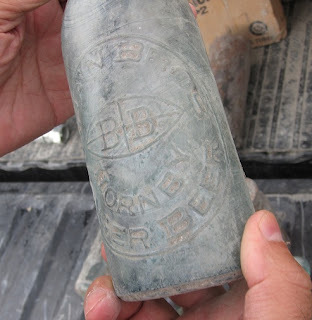 Found this link from an Ebay auction for a couple of the Pilgrim Bottles found at the excavation. Great work intertwining the history behind the site and the modern bottle finding connection. 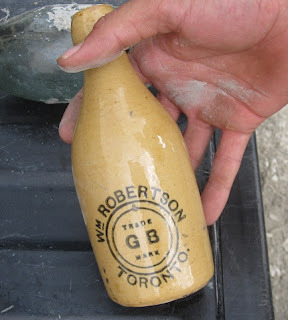 New Brunswick Stoneware and Bottles, much of which is buried in and around Toronto Dumps Etc. Things Which kept in Glass Bottles will give purity of taste .Glass bottles have so many advantages - we don’t even know where to start. First of all, they’re reusable. Hi : The cobalt London Ink is most definitely from London , England. Obvious from the shape and lip form. Plus there is no history of that bottle / Co. in London , Ont.